I am learning the "Art" of the sale. I don't mean that to be funny, it is very serious business. One of the websites I subscribe to is a gentleman who runs an art gallery in Arizona. He has mentioned in the past how much people like to negotiate when purchasing! It apparently makes them feel that they have gotten a bargain, or at least had some control in the process. I'm not entirely sure why, but suffice it to say the negotiation process is important to them. If we take a hard line in our pricing, then the customer can, and often will, walk away. So, we are better off setting our prices so as to allow some room for negotiation. And by that I DON'T mean high prices! I am telling you this because lately I have been learning this lesson and it hasn't always been a pleasant experience. But I have learned to be flexible and now I am beginning to reap the rewards. Let me tell you an experience I recently had. Last week I received a phone call from a nice little lady I will call JoAnne. 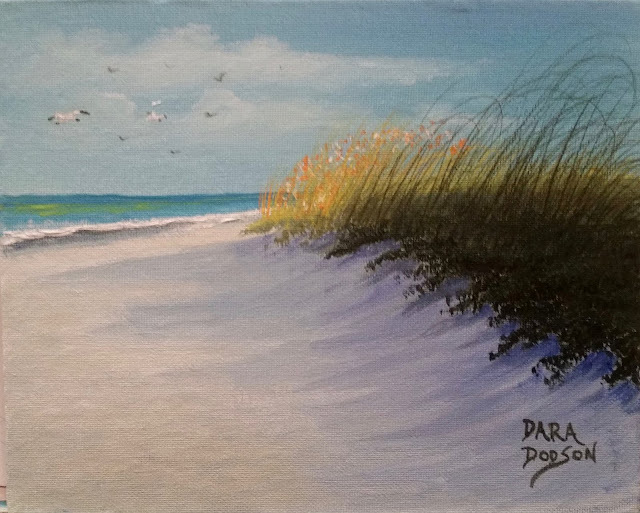 She had seen one of my paintings at the Back 40 A1A restaurant here in St. Augustine. She wanted to purchase it but wanted me to come down $10 in price from $70 to $60. I hesitated for just a second and then said, "Sure, I'd be happy to do that for you." She was so happy she said she might just purchase another one also. Well, the next day she called me back and ordered 3 paintings to be custom painted as gifts for her children! Of course, she then added, "I hope you will give me a similar price for them." I will, but she wants these to be larger so they will be more expensive, but still priced the same per square inch as the first one. The painting was an 8 x 10 and she now wants 11 x 14 or larger. The point here is that being willing to negotiate won me more work and more money in the long run. So we both won! She purchased my "SEAGRASS AND GULLS' painting which I loved and so did she. It is another idea that has proven to be popular. Who would ever guess that seagrass is so popular? I will certainly never complain. I enjoy painting it and it is fairly easy to do. I think it is very peaceful and calming to look at and beautiful in nature. Speaking of pricing your artwork, I will do a post soon on how to set your prices, OK? So enjoy the photo of the painting she purchased and I will post the commissioned three when they are done. Thanks for looking!